Garbanzo bean flour is made by grinding dried garbanzo beans (chickpeas) into a powder. It's a popular ingredient in Middle Eastern and Indian cooking, where it's found in dishes such as falafel and hummus. Since garbanzo beans are high in protein and fiber as well as several minerals and B vitamins, their flour is highly nutritious. Using garbanzo bean flour is an excellent way to increase your protein and fiber intake and it's perfect for vegan, vegetarian, and omnivorous dishes. Its mild nutty flavor works well for many different recipes, both savory and sweet. A cup of chickpea flour contains about 350 calories. Most of those calories come from carbohydrate. Ten grams of carbs comes from fiber, ten grams come from sugar and the remaining carbohydrate is starch. The estimated glycemic load of chickpea flour is 27. There are different types of fat in chickpea flour. There are six total grams of fat in the flour. Most of that is polyunsaturated fat (2.7 grams), about a gram and a half is monounsaturated fat and less than one gram is saturated fat. One cup of garbanzo bean flour has over 20 grams of protein, making it a smart choice if you are trying to increase your protein intake. Flour made from garbanzo beans can help you increase your intake of certain vitamins and minerals. 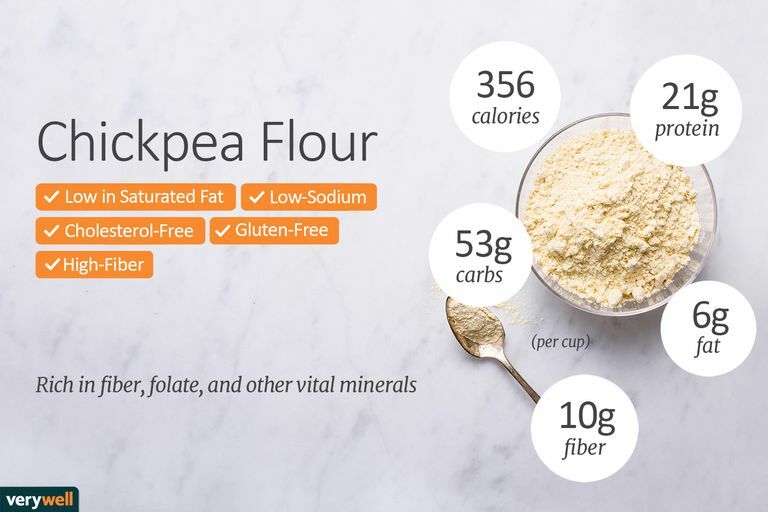 Chickpea flour has more than 4 milligrams or iron, 150 milligrams of magnesium, over 2.5 grams zinc, 1.6 milligrams of niacin, and 400 micrograms of folate. Since garbanzo bean flour is high in a B-complex called folate, it may be helpful for women who are pregnant or may become pregnant because it helps prevent a birth defect called spina bifida. In addition, garbanzo bean flour is high in fiber that's essential for a healthy digestive system. Plus garbanzo bean flour is high in minerals that are important for strong bones and teeth and for normal muscle and nerve function. The combination of protein and fiber means that foods made with garbanzo bean flour are good choices for people who are watching their weight. It's a combo that keeps you fuller longer and helps you feel satisfied between meals so you're less likely to snack. Also, healthy foods made with garbanzo bean flour may be beneficial for people with diabetes because the fiber helps slow down the absorption of dietary sugars. Finally, consuming a diet high in legumes may help to reduce cholesterol levels and may be a good choice for a heart-healthy diet. For example, the Mediterranean diet includes legumes and is well-known for its potential health benefits. Is garbanzo bean flour gluten-free? Yes, since garbanzo beans are legumes and not any type of grain, garbanzo bean flour doesn't have any gluten so it's perfect for a gluten-free diet. Can it be used as a wheat or other gluten grain substitute? In some cases. While it may not work for baking a typical loaf of yeast-bread, it will work very well for quick breads like banana bread or muffins and cakes. It has a nice nutty flavor that works in many foods. Is garbanzo bean flour the same as chickpea flour? Yes. Garbanzo beans are also known as chickpeas so garbanzo bean flour is sometimes called chickpea flour. Garbanzo bean flour is also called besan, gram flour, and cici bean flour. Garbanzo bean flour is probably going to be a little hard to find in the typical grocery store but you may find it in the natural foods area or in an international foods section. If you can't find it in your regular grocery store, you can try natural foods stores and small co-ops. Garbanzo bean flour is sold in sealed bags that you can keep at room temperature until the bag is opened. After that, you can reseal the bag or put the flour in a sealable container and keep in a cool dry area, or even the refrigerator. If you need to store garbanzo bean flour or several months, it may be best to keep it in the freezer. If you can't find it in the market, you can make your own chickpea flour. Garbanzo bean flour is easy to make. To make garbanzo bean flour, simply use a food processor or coffee grinder to pulverize the dry beans into a powdery form. You can also make flour from canned chickpeas. Rinse them in water, blot them dry, and spread them on a baking sheet to roast in a 450-degree oven for about 30 to 40 minutes. Let them cool and process them into flour. Once you've got your flour made, there are different ways to use it. You can use garbanzo bean flour to make high-protein wraps and pancakes or add it to vegetarian dishes to boost the protein content. Otherwise, it can be used in a variety of recipes that utilize ingredients that mesh well with the nutty creamy flavor of garbanzo beans. Using garbanzo bean flour can give a nutritious boost to snack foods such as brownies, cookies, and other bars. But, to maintain the health benefits of the garbanzo beans, remember to choose recipes that are generally lower in fat, sugar, and calories per serving. If you have an allergy to chickpeas, you should avoid garbanzo bean (chickpea) flour. Medical sources, say that legume and lentil allergies are starting to become more common especially in areas including in the Mediterranean, Middle East, and some Asian countries. The American Academy of Allergy, Asthma, and Immunology suggests that the best way to determine if you have an allergy to chickpeas or chickpea flour is to have your qualified healthcare provider perform an oral challenge. American Diabetes Association. "Types of Carbohydrates." Bazzano LA, Thompson AM, Tees MT, Nguyen CH, Winham DM. "Non-soy Legume Consumption Lowers Cholesterol Levels: A Meta-analysis of Randomized Controlled Trials." Nutr Metab Cardiovasc Dis. 2011 Feb;21(2):94-103. Centers for Disease Control and Prevention. "Plan Ahead: Folic Acid Can Help Prevent Certain Birth Defects." Widmer RJ, Flammer AJ, Lerman LO, Lerman A. “The Mediterranean Diet, its Components, and Cardiovascular Disease.” The American Journal of Medicine. 2015;128(3):229-238. What Is Spelt Flour and Is It Good for You?